How will the doctor determine what is wrong? Following the history, the doctor will perform a detailed ‘Head & Neck examination’ (which is especially important in smokers). After this, the examination concentrates on the larynx (the ‘voice box’). This area of the body is hidden in the neck and is not immediately visible without specialised techniques and equipment. An examination of the larynx is known as ‘a laryngoscopy’. ‘A laryngoscopy’ allows the doctor to visualise the gross movement and structure of the vocal folds. It can be done in a number of ways (as described below), and each method has its strengths and weaknesses. Your doctor will determine the most appropriate method which depends upon your presentation. 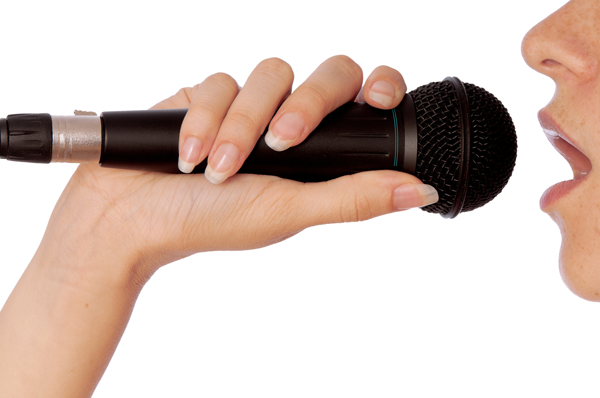 Laryngoscopy is, however, unable to give information about the vibration characteristics of the vocal folds which can be very important in many cases. To do this properly, a technique called ‘stroboscopy’ is required. This is the simplest and most traditional way of examining a larynx. It involves using an angled mirror (much like you would see at a dentist) and a headlight. The mirror is introduced to the back of the throat (through the mouth), allowing the doctor to see a reflection of the vocal folds and throat structure. It allows for a good overview of these structures, however, it does not provide magnification or the ability to record and review the examination. This is the most common method of examining the vocal folds and involves introducing a thin, flexible, spaghetti-like tube a few centrimetres through the nose to the back of the throat until the larynx is visualised. It gives excellent information about the structures of the nose, throat and vocal folds. It is especially useful in providing information whilst the patient is asked to perform certain tasks such as speaking, counting, singing and swallowing. 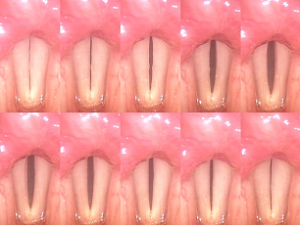 This method provides a magnified view of the vocal folds and gives the clearest picture available in the office. Similiar to a mirror, a straight telescope with an angled lens is passed through the mouth to the back of the throat. With a built in light source, the rigid laryngoscope can give an excellent view and allows for video recording of the laryngeal examination. Stroboscopy can be a powerful addition to the laryngoscopy examination. With this technique, a microphone is held on the skin of the neck whilst the laryngoscopy is performed (the examination is performed using a stroboscopic (or flashing) light source). By reading the patients voice frequency, the stroboscope is able to slow down the images of the vocal fold vibration (also known as the mucosal wave). When this is used in combination with a video recording, we are able to examine the mucosal wave vibration on a frame by frame basis. This is by far the best method of assessing and evaluating problems with vocal fold vibration including nodules, polyps, cysts and scars. Stroboscopy, however, is not always available as it requires specialised equipment and can sometimes be difficult to perform and interpret. It requires someone with with special interest in the area and a subtle eye for detail.